Have you ever baked a delicious apple pie without using apples? Well here is your chance, and you might just fool someone to think they are eating an apple pie. I fooled a few people. Combine water, sugar, cream of tartar and bring to boil. Add whole crackers, no need to stir. Simmer 5 minutes. 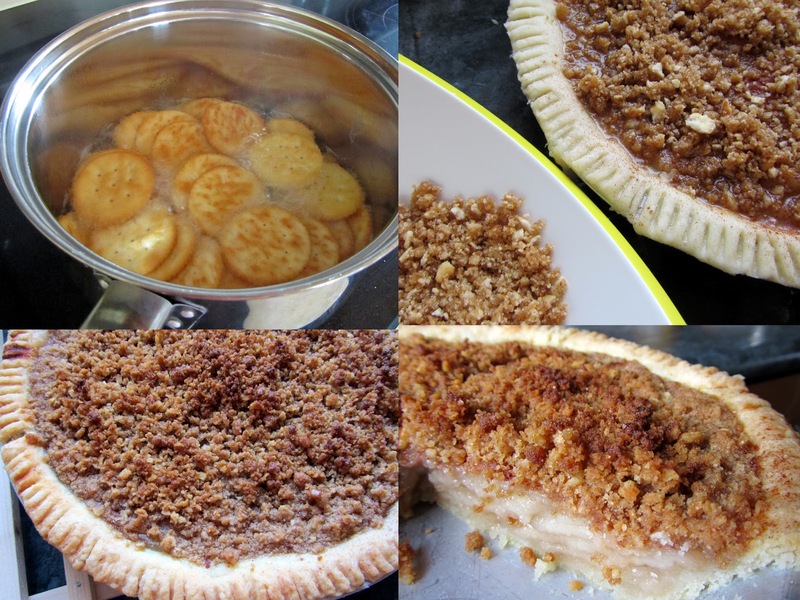 Pour mixture into unbaked pie shell and sprinkle with lemon juice and cinnamon. 25 buttery crackers, finely crushed, one 225 g box of crackers will do for the filling and topping, you will have some crackers leftover. Combine first three topping ingredients, add melted butter. Using your fingers or pastry blender mix until crumbly. Bake in a 400º oven for 15 minutes, reduce heat to 350º and bake for another 15 minutes. Serve warm, plain, or with ice cream. You will think you are eating apple pie. a similar recipe tucked away somewhere. For those who've lost theirs or are interested in a slightly different version, here is mine. They are easy to make so enlist the help of the little ones. As you can see, they are a hit with my grandchildren. Cover a large baking sheet with waxed or parchment paper. Set aside. Mix oatmeal and coconut in a large bowl and set aside. Mix sugar and cocoa together in medium sized saucepan. When mixture has boiled, remove from heat and stir in vanilla. Immediately pour over oatmeal and coconut and mix well . Working quickly, drop by teaspoonfuls on to prepared baking sheet. Refrigerate until firm and then place in cookie tins. Keep in a cool place. Makes about 2 -2 1/2 doz. cookies. 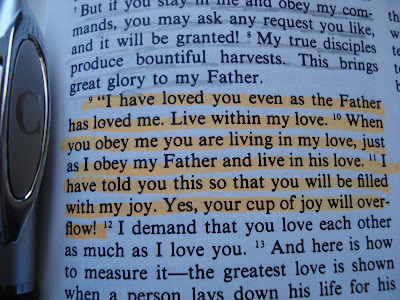 Reading the Bible is a very personal thing. and listen to what God is saying. there were times that the Bible just did not make any sense to me. I felt like it was written in a way that I just could not understand. with a text or translation that makes the most sense to you. or the poetry of the traditional version of the Old King James . Look here to find out what version is best for you to understand. write notes, underline, mark it up so it becomes the road map of your life. that my parents gave to me when I was 14. It is true that any version of the Bible is the living word of God. 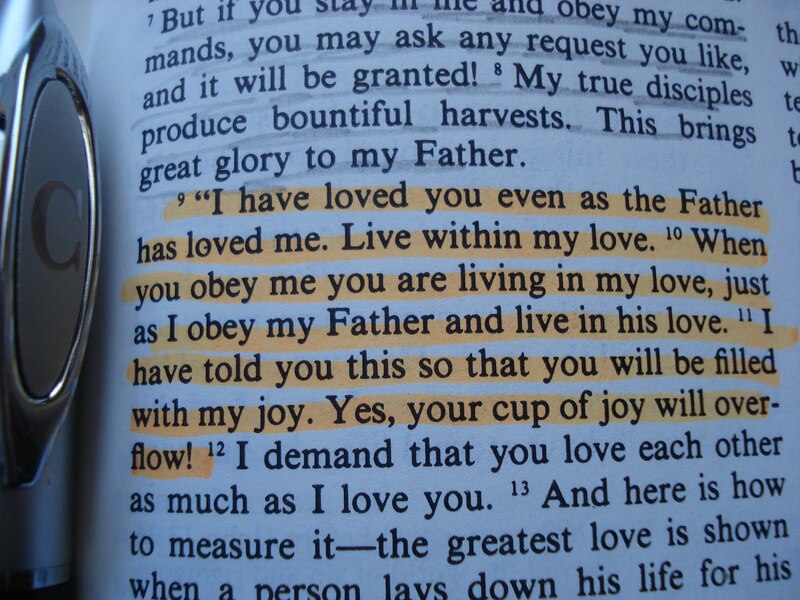 the verses that are meaningful to you. they received a new student Bible. write in the side margins of why this verse was important to them. and perhaps make it meaningful to them as well. and make it more personal for themselves. I haven't had a Chinese egg roll in a very long time and hardly remember how they taste - I just remember that I liked them ! I looked at some regular recipes and came up with my own gluten-free version. 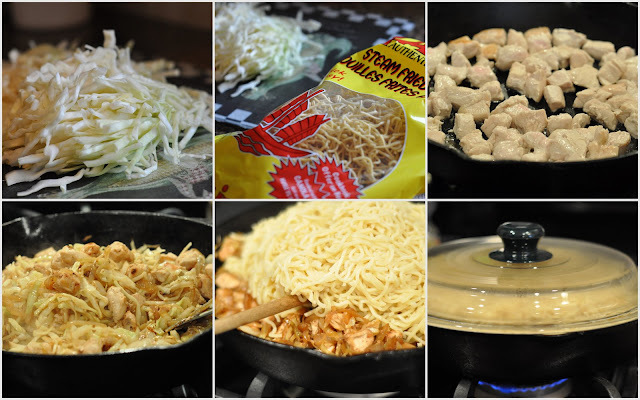 We enjoyed them this evening with Anneliese's 'Chicken Chow Mein' - substituting white rice noodles for the wheat ones . 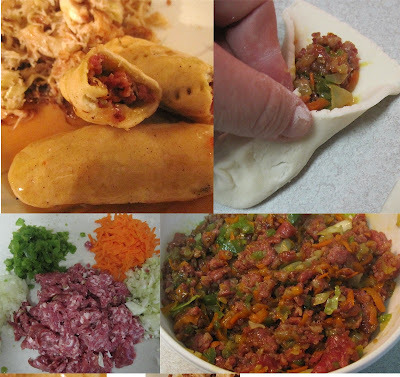 So here is my recipe -- a bit of work to prepare but I thought it worth it. roll dough out fairly thin , and cut into 3 x 4 inch pieces. heat oil and deep fry the rolls until they are golden . mix all ingredients in a small sauce pan and cook until mixture bubbles and thickens. 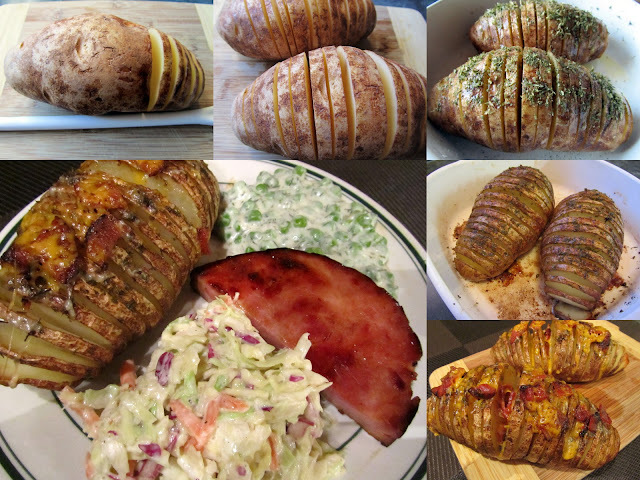 Baked potatoes can be served many ways, sometimes it's fun to do them a little differently. I liked the way these looked, and they were so pretty on the plate. Scrub potatoes and dry on paper towel. Cut the potatoes into thin slices but don't cut all the way through. Lay a mixing spoon along side potato, as you cut the knife will stop at the spoon handle and will prevent from cutting all the way through the potato. Place potatoes in a greased baking dish and fan them by slightly pulling the slices apart with your fingers. Drizzle with melted butter and sprinkle salt and pepper over potatoes. Sprinkle your favorite herb on each potato. Bake in a 425º oven for 50 minutes or until tender. Remove from oven, sprinkle with cheeses and bacon and bake for another 12 to 15 minutes or until lightly browned and the cheese has melted. I used quite large potatoes so this served 4 good appetites. 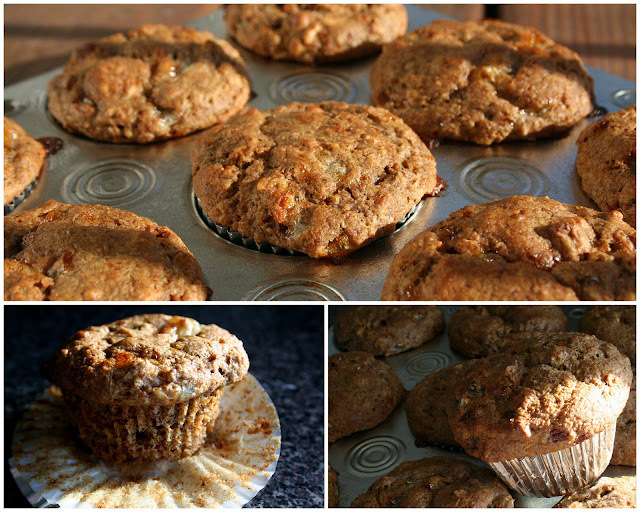 With the addition of cottage Cheese...these muffins have hidden protein tucked alongside fiber for healthy lunch box ideas. Since discovering buttermilk powder, I am always testing and tweaking old recipes to include buttermilk powder to replace liquid buttermilk. Line 1 - 12 cup muffin tin with large paper liners and spray the tin and liners with cooking spray. They will not stick to the liners this way even when warm. Pour boiling water over the all-bran in a medium bowl. Allow to sit while measuring the remaining ingredients. Put the flour, oatmeal, baking powder, baking soda, salt, sugar, buttermilk powder and walnuts and dates or raisins in a medium bowl and stir well. If you use dates, use your fingers to break apart the chopped dates and rub with flour to keep separated. Stir together the remaining ingredients in a large bowl. Fold the bran-ceral mixture and dry ingredients into the wet ingredients and stir just until combined. You don't want to overstir...use a quick and gentle fold to keep the rising mixture from deflating. Use a large icecream scoop if possible to divide between the muffin cups. They will be full. 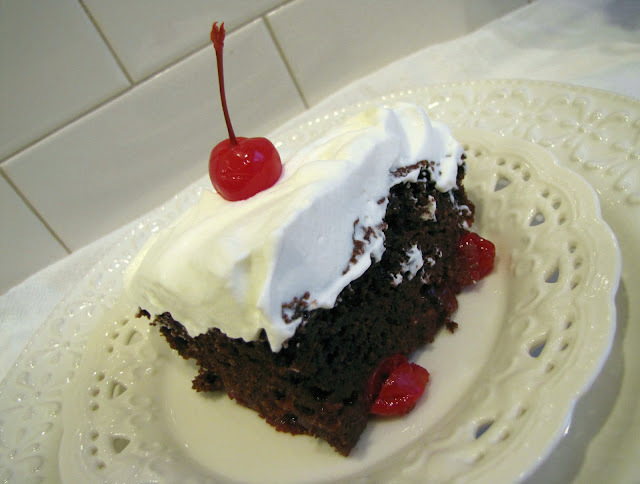 I first heard of this black forest cake 'short-cut' a few years back from my sister-in-law. She insisted it was moist and delicious...and so simple to prepare. 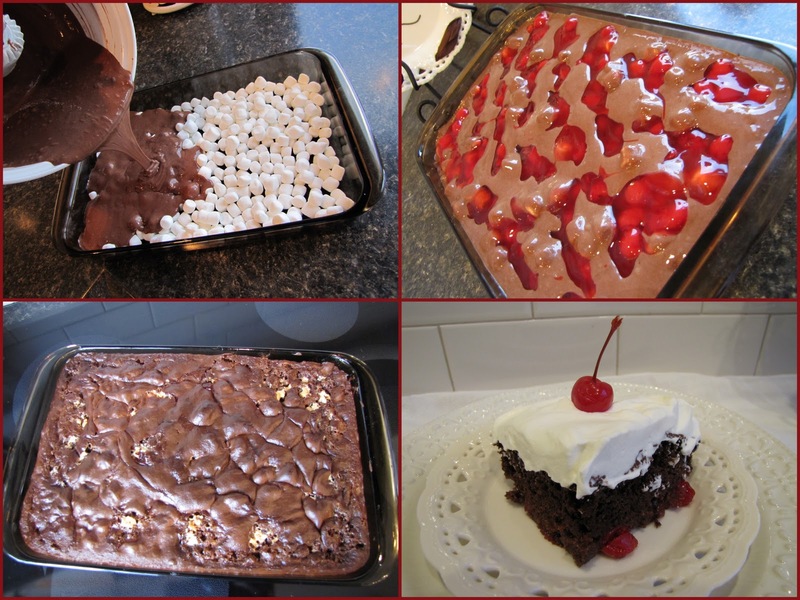 When I needed a birthday cake in short order recently...this recipe came to mind. It went over well! Pour four cups of mini-marshmallows into a greased 9x13 inch cake pan. Bake at 350°F for about 50 minutes...or until toothpick inserted comes out clean. And don't forget...the cherry on top! This has been a family favorite at my mom's for many years. I call it a Mennonite version of Chinese food, because it really does not taste like any kind of Chinese take out, especially when she serves stewed cabbage with raisins and chicken fried steak alongside with it. All I can say is that everybody loves it! Chop chicken into bite size pieces and cook on medium to high heat, in a small amount of oil, in a large frying pan. Using salt and pepper shakers, sprinkle lightly to season. When chicken looks white on all sides, this should not take long, add onion, stirring until tender and then add cabbage. Salt cabbage lightly using salt shaker. Add more oil if it begins to stick to pan and keep stirring and cooking until chicken is partly browned and vegetables and juices caramelize to a golden color. Meanwhile cook noodles according to directions on package, until just done, then drain and rinse. Add ¾ cup water to meat, top with cooked noodles, do not stir, cover and allow to cook on low heat just to steam noodles. * if using flash-frozen, pre-salted chicken, it is not necessary to add any extra salt. In the past week or two I've been going through boxes in our crawl space. We've lived in the same house for almost 36 years and things have accumulated down there. It was time to review, reduce and recycle. a German Bible published in the early 1900's plus several more. Seeing all these Bibles reminded me of the importance of this Book in my walk with God. The next morning in Church, the speaker told a story that challenged me. A missionary shared Jesus with a man who was a Shaman in his home village in Laos. The Shaman prayed to receive Christ but the missionary had to leave that same day. So he asked the missionary - "What do I do now?" The missionary asked him if he could read. Hearing a "yes", he gave him a Bible. "Start reading in John", he said, "and do it." he had led 800 people in his village to Christ. Read it and Do it! 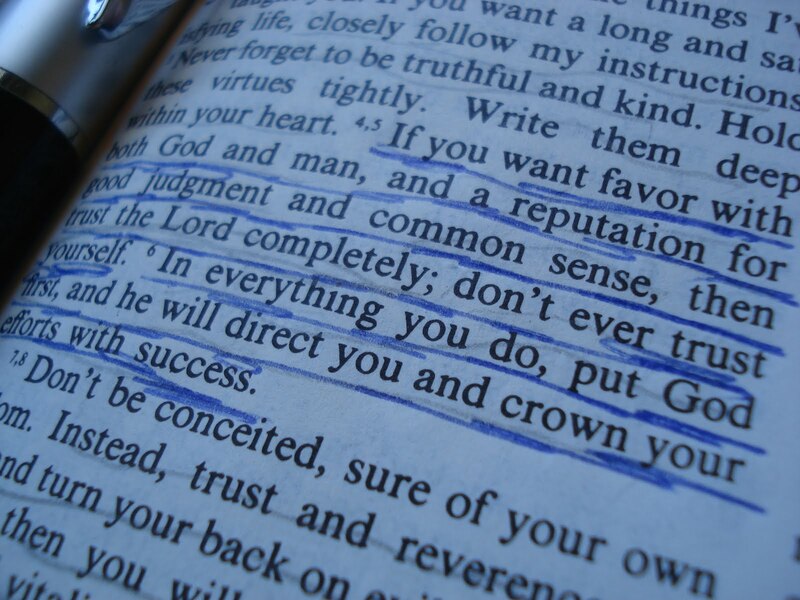 Do not merely listen to the Word... Do what it says. This is a tasty chili that will feed a crowd. Plan ahead because you need to soak the beans. Place on shallow pan and roast in 375 degree oven till cooked through. Cookies are always a good lunch box or afternoon coffee break treat. 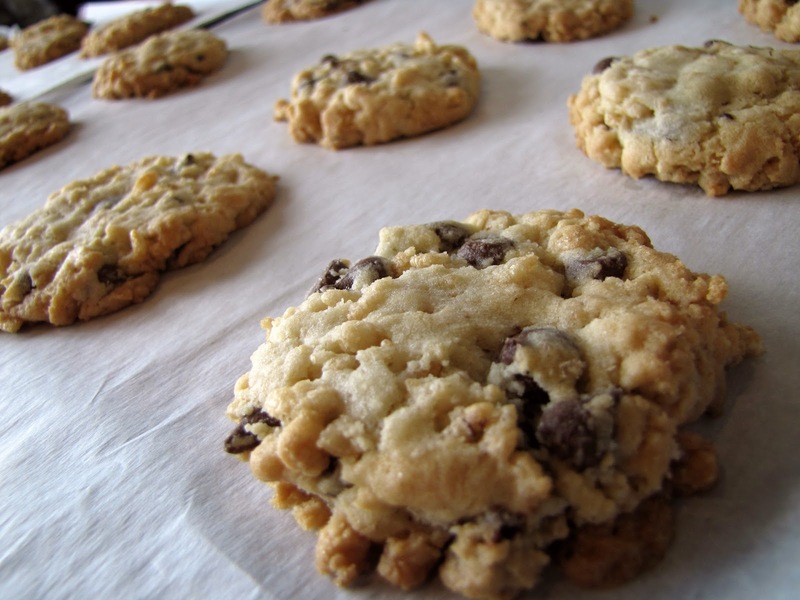 The grated chocolate bar and ground rolled oats in these cookies make them slightly different than regular chocolate chip cookies. The peanut butter is really good in these cookies, but can easily be replaced with soy butter or by replacing the 1/3 cup peanut butter with another 1/3 cup butter. Cream together butter, peanut butter, sugars and eggs. Grind oats and add along with flour, vanilla, salt and baking soda. Mix well. Grate in chocolate bar and mix until just incorporated. Drop onto lightly greased or parchment lines cookie sheets. Bake at 350º for 12 minutes. This is one of our favorite restaurant soups. Once I developed a recipe we loved...my beloved said. ..."well there is another thing that we don't need to go out to eat." Almost anything you can find in a restaurant can be duplicated and often it ends up being tastier than the original. If you like spicy food...give this one a try. If you want to tone down the heat of the soup..simply use mild Italian Sausage. Another option is to add the crisp fried bacon to the crumbled fried sausage. Add the Hot Italian Sausage to a large pot over medium heat and scramble fry until browned. Use a stiff egg lifter to chop it apart to form small crumbles. Remove from heat and put the sausage and bacon into a colander over a bowl. Allow to drain well and then discard the fat. Chop the onion and mince the garlic and fry in the same pot which has a bit of drippings from the sausage over medium heat until the onion is translucent. Add the sausage back to the pot. Scrub the potatoes and slice them with the skin on. Add the potatoes and chicken broth and bring to a boil. Turn down the heat and simmer for 20 minutes. Slice the pepper into small pieces and break the kale into bite sized pieces. Add to the soup and simmer 10 minutes. Add the evaporated milk and heat through. Garnish with Italian Cheese, crumbled crisp bacon and serve with crusty bread. Guess what? One of our own is celebrating a milestone birthday today! Happy Birthday Judy. 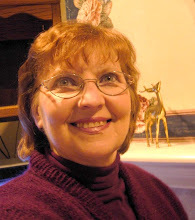 Why don't you go over to Judy's Front Porch blog and wish her a wonderful day. I've already been there and she doesn't appear to be home...so better still write a note and she'll find it when she returns! On new years day I make new years cookies, which us Mennonites call portzelky. I'm always happy when there are some left over portzelky for making bread pudding. Thick sliced day or two old raisin bread works well in this recipe, and since it's not deep fried like portzelky, the bread would be a healthier choice. This is most definitely a comfort food and not to be eaten after a big meal. Cube bread and place in a well greased souffle or deep dish casserole dish. In microwave or on the stove top heat milk and butter together just until butter melts. Beat eggs and add to milk mixture. Stir in cinnamon and vanilla. Pour over bread cubes. Bake in pre-heated 370º oven for 30 minutes. Lower heat to 350º and bake another 20-30 minutes. During the last 20-30 minutes you may want to loosely lay a piece of foil over the top if it is getting too dark. Allow to sit for 10-15 minutes before serving. This helps the pudding to set. In a small sauce pan stir together first 3 ingredients. Set over medium heat stirring constantly until mixture bubbles and sugars are dissolved. The sauce will thicken in about 3-4 minutes. Remove from heat and add vanilla and a pinch of salt. Serve warm over warm bread pudding. Ice cream is a nice choice for a topping as well. 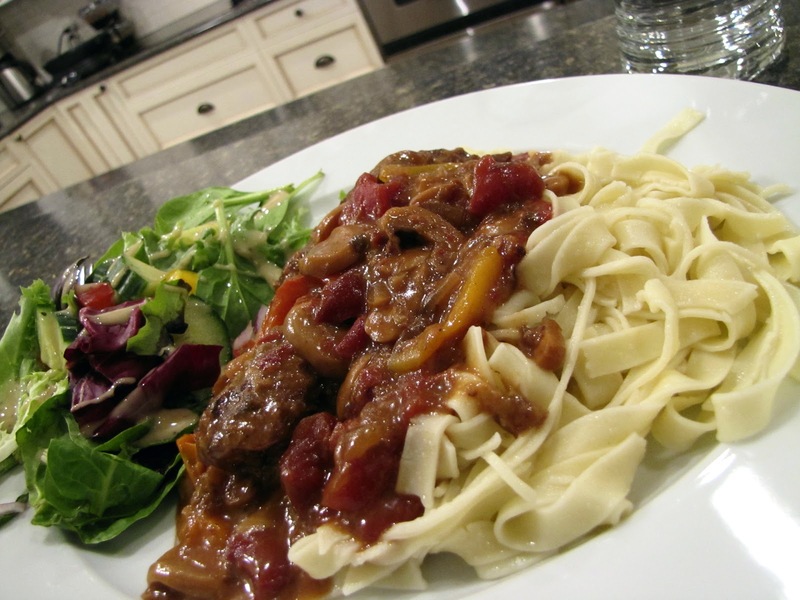 Steak tenders smothered with tomatoes, peppers, onions and mushrooms...and served on a bed of noodles. That's my idea of a perfect winter comfort meal. I made noodles for the first time recently....just like my mother-in-law used to. I decided to make a skillet steak to go with the noodles...just like my mother-in-law used to as well. Good meals make for good memories! Dredge steak in flour...and pound each piece. Cover tightly and simmer for 1 hour. Add remaining ingredients, stirring to mix well. Cover tightly and simmer 30 minutes longer. Serve on a bed of noodles or rice. * I'm sure the molasses could be left out, but it adds a nice flavour. I got this salad idea from my friend Verna. The dressing is especially good although I've reduced the sugar a bit for less sweetness. The picture was taken in the summertime when I'd substituted a nectarine for the pear. Make dressing: Combine all ingredients in a salad dressing shaker or in a blender. Place salad ingredients into a large salad bowl, keeping back 2 tablespoons each of the shredded cheese and cashews. Shake dressings once more and drizzle over salad. Garnish with reserved cheese and cashews and serve immediately. 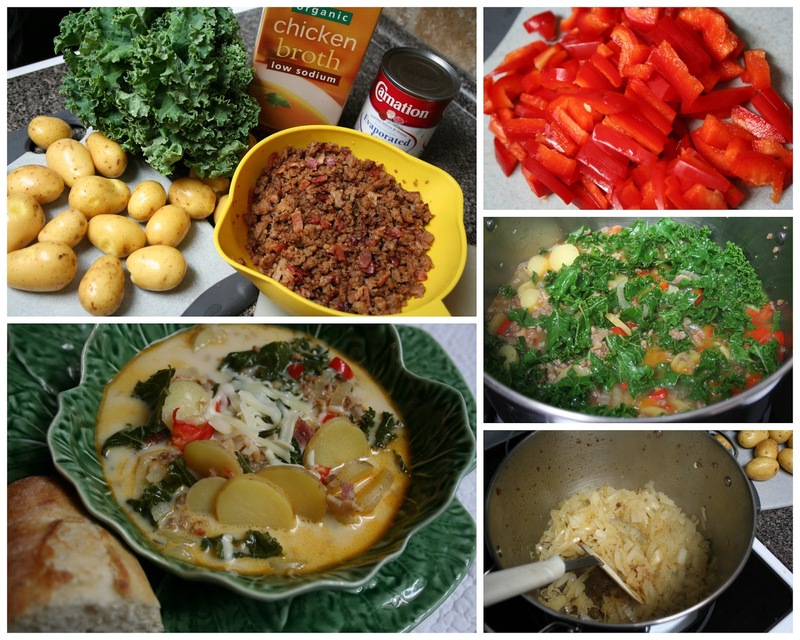 This is not a recipe I am sharing today, the photo does fit into my story though. -would I serve him a delicious meal plated up beautifully like the photo above? -would I place my opened Bible on the coffee table to a favorite passage and honestly say I had been reading His book faithfully and doing what it teaches? -would I re-arrange my schedule and take time to sit and listen to Him? Of course I would want to do all this and more, to give Him my best. I would also want Him to know that I would strive to be more attentive to the needs of others, reaching out a helping hand when needed. I just have to share this recipe that I got from my friend Sandi. It was a big hit at our Bible Study Potluck Dinner. This is such a good casserole to bring to a potluck. 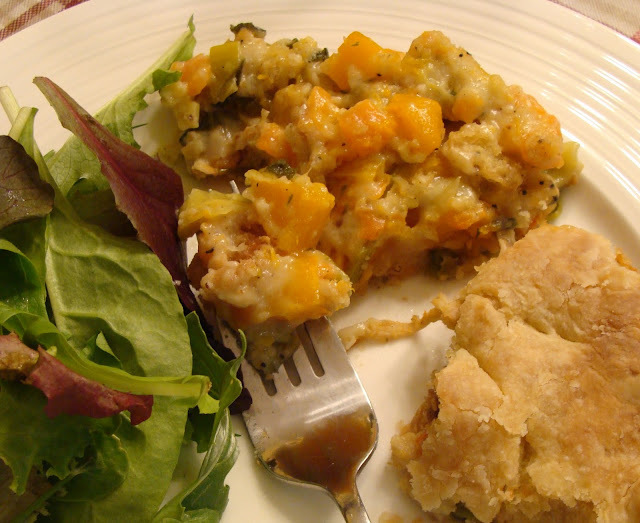 It is an excellent vegetable side dish with cheesey deliciousness. Cook carrots in salted boiling water until tender. Melt a 1/4 cup of butter in a separate sauce pan. Add onion and cook until clear and soft. Stir in mustard and milk until it boils and thickens. 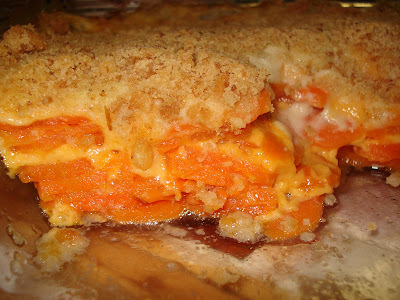 In a 9x13 inch pan, layer half of the carrots, half of the grated cheese, and another layer of carrots and grated cheese. Pour over all of the sauce. Top with bread crumbs and melted butter, adding garlic to taste, or use crushed croutons. Bake uncovered at 350 for 25-30 minutes until browned and heated through. A hearty breakfast, a luncheon or dinner dish . . . you choose. Add fruit or a salad and call it done. In frying pan, melt butter and cook hash browns about 5 minutes. Sprinkle with salt, pepper and celery salt. Spread into greased pie plate and top with mushrooms, red pepper, onion, cheese and bacon. Whisk together eggs and milk and pour on top. 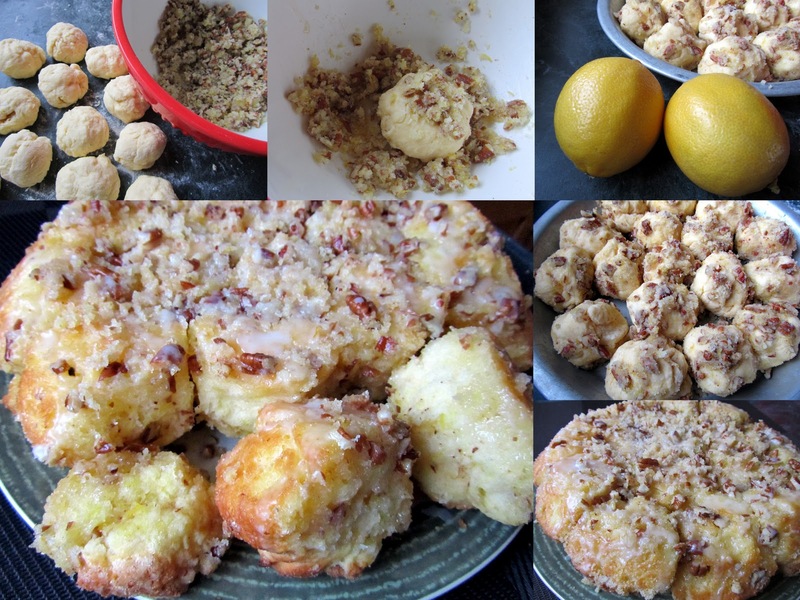 These lemon pull a-parts are easy to make and are a satisfying snack for that afternoon coffee break or a great addition to your brunch menu. You use a biscuit dough for this recipe and it doesn't take very long to put together. Whisk together flour, baking powder, and salt in a bowl. Using a pastry blender cut butter into dry ingredients. Crack eggs into a cup, add enough buttermilk to fill 1 cup. Lightly mix eggs and buttermilk with a fork. Pour into bowl with dry ingredients. Mix only until flour is incorporated, handle as little as possible to make light biscuits. The dough will be sticky and in order to roll into balls you might need to add a wee bit of flour. The dough should still be slightly sticky. Scoop pieces of dough and roll into 17 balls. 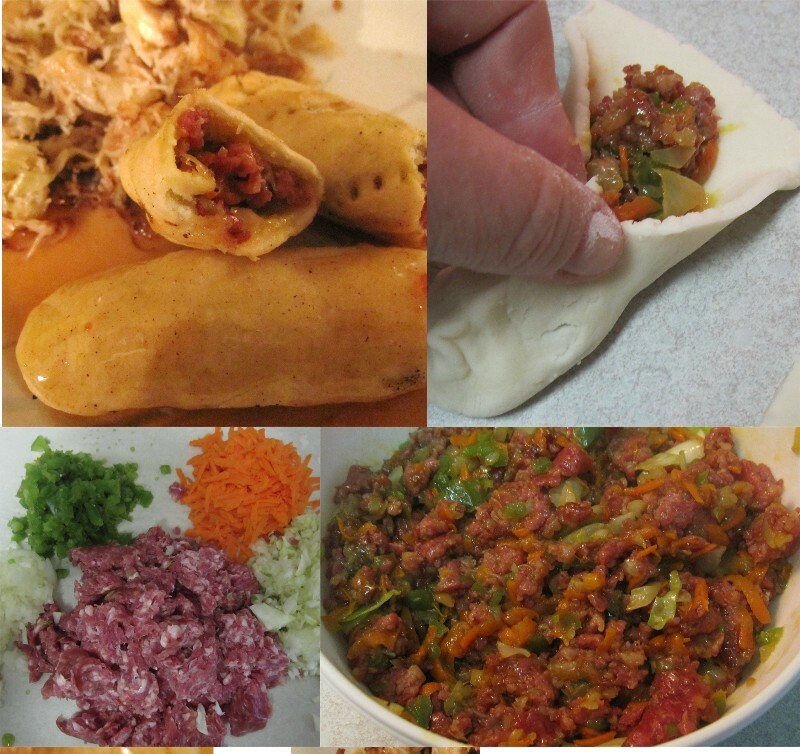 Combine ingredients and roll the balls of dough in this mixture. Place in a greased 9" round pie pan. Bake in a 400º oven for 20 to 25 minutes until golden brown. Invert pan immediately on a plate. Here's a quick vegetable idea I got from my sister's daughter in law Ingrid. Summer Savoury is the secret to the wonderful flavour of this simple side dish. Adjust the amounts of vegetables to number of guests you are serving. One thing to remember when cooking any vegetables is to not over cook them. Place fresh green beans in another pot along with the Summer Savoury. Add water to cover about 1/2 the beans. Bring both pots to a boil. Carrots are good boiled till done, but you want to steam the beans until they are fork tender. You do not want either of the veggies over cooked and mushy. While the veggies are cooking in a small fry pan saute onions in the butter. Drain veggies well and remove Summer Savoury. Toss veggies together with the sauteed onions. Serve immediately. One of the simple things in life that I keep giving thanks for is a private, hot shower. Maybe I’ve read too many books about hostages or inmates who don’t have this convenience, not to mention the children I saw floating on shacks along the banks of the muddy rivers in Indonesia. I don’t know about you, but it makes me appreciate something I would not want to live without. There is nothing like soap and clean, warm water after working up a sweat or getting chilled while walking in the rain . . . and the wonderful feeling of being clean again. There is another kind of feeling clean that is even better. I can hardly live with myself when I know I’ve grieved the heart of God. What I mean by that is that sin strains relationships and keeps us from experiencing peace. So, on a spiritual level, I need cleansing and refreshing. Being forgiven by God and those we have wronged is the best kind of feeling clean. 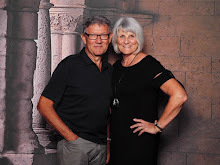 Sometimes I wonder why it takes me so long to humble myself to ask forgiveness, when there is nothing quite as wonderful as a restored relationship. Let us not drag along our sack of unforgiven sins into the New Year, but rather leave them at the cross and allow the blood of Jesus to wash us white as snow. This is the way to a truly Happy New Year. Chow Mein is a great way to use up leftover meat and well worth keeping a few staple items in your pantry. This recipe is quick to put together and can easily be doubled or tripled for a crowd. You can have dinner on the table in 30 minutes and that includes chopping vegetables. Boil the water for the noodles while you slice and prepare your vegetables. Once the water is boiling, salt it and cook the noodles and drain and set aside in a colander. Heat the oil over medium heat and add the onion first. Allow to fry for a minute or two and then add all the vegetables except for the snap peas and green onions. Stir-fry until the vegetables are tender. Add the mushroom soup and soy sauce and meat and heat through. Add the snap peas and noodles and bring to a simmer. Now that the Christmas baking has disappeared...it might be time for some extraordinary ordinary cookies! My grandson loves to bake cookies when he comes to visit and they all must include chocolate chips. Here's an old favorite that I pulled out of the archives...one that my children would remember from their lunch boxes of years gone by. Beat butter and sugar together until well blended. Combine flour, soda and salt. Add to creamed sugar mixture and mix until combined. Stir in rice cereal and chocolate chips (and nuts). Drop by tablespoon onto parchment lined cookie sheets. Bake at 350° F for 10-12 minutes...or until lightly browned. Allow to cool for several minutes, and then transfer cookies to wire rack to cool completely. Or better still...eat them warm! Yield: about 2 1/2 dozen cookies. What should I make with these leftovers? I'm sure we all have some in the refrigerator that were not eaten during Christmas. Soups, casseroles and sandwiches are all good choices for using them up. A tortilla shell filled with turkey, chopped up veggies, and cheese makes a quick and satisfying lunch. Treat your taste buds to a bit of savoury and sweet by topping this quesadilla with cranberry sauce. Chop up meat and veggies. Grate cheese. Lightly spread one side of 2 of the tortilla shells with butter. Lay butter side down on grill. Top each tortilla with cheese, saving half the cheese. Stir together the salsa, chilies, meat and veggies. Divide between the two tortillas over the cheese. Top each with the remaining cheese. Butter one side of the two remaining shells and place butter side up on top of the mixture. Turn grill to medium heat. Grilling a little bit lower will ensure the ingredients inside the quesadilla get really hot while browning the outside evenly to a nice crispy exterior. To serve top with cranberry sauce for a sweet finish, or sour cream and salsa for a bit more spice. On a recent trip down the baking aisle I noticed some parchment paper cups. I had never seen them before. 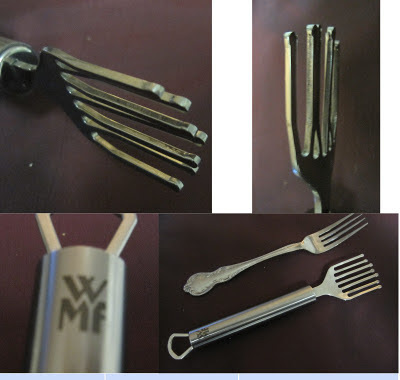 I just want to say that these take the guesswork out of muffin baking. Cupcakes are a no brainer . . . you use paper cups. But muffins are always a guess. I like the way they look without the paper, but I don't want to chance having to pry them out of the pan. For this reason parchment paper cups are great to use for butter tarts and muffins that can leave behind a sugary or fruity mess. The following recipe comes from my friend, Karin, shared during the days when we would get together for coffee and play dates with our kids. Prepare muffin tins and pre-heat oven to 400° F.
Combine streusel ingredients, using a pastry blender to make a crumb mixture. Chill. In a separate small bowl, combine eggs, milk and melted butter, then stir into dry ingredients. Fill each muffin tin with about a tablespoon of batter, making a small indentation. Place a teaspoon of jam on each center and cover with the rest of the batter. Bake for 20 - 25 min. This is a quick and easy salad to put together and tasty enough for everyday or serving company. A bag of Cole Slaw mix is the secret. 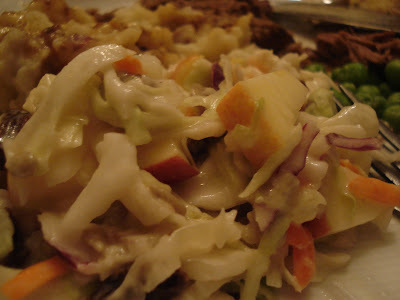 Combine the Cole Slaw mix with the onion, apples and raisins. Combine the Mayonnaise, sugar, vinegar. Pour over Cole Slaw mixture, and sprinkle with almonds. to this variation of Butter Tart Bars. For the base, cut butter into flour and sugar until crumbly. Press into 15 x10 inch pan. Bake for 15 minutes at 350degrees. Remove from oven and sprinkle chopped cranberries over crust. For Topping, place all ingredients except almonds in a bowl. Beat with a spoon until well blended. Pour over base and sprinkle with chopped almonds. Let cool for 10 minutes and then cut while still warm with a knife or bench scraper dipped in hot water. These bars freeze very well. When I slice a loaf of bread I am always struck by the fact that once sliced a loaf of bread can never be whole again . has irretrievably changed something whole and beautiful! And yet the popular saying ... "Greatest thing since sliced bread!" by which all other inventions measure their value! to feed and nourish those who partake of it. some filled us with joy , some with sorrow or despair. growing us in wisdom and strength and faith. that He will provide all that we will need ! "Blessed be the Lord, who DAILY loads us with benefits!" May all your 2012 'slices' be loaded with the sweetness of God's love!